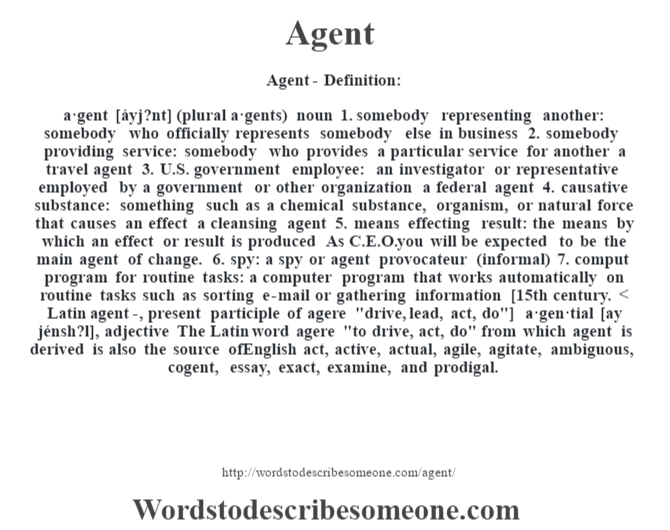 a·gent [áyj?nt] (plural a·gents) noun 1. somebody representing another: somebody who officially represents somebody else in business 2. somebody providing service: somebody who provides a particular service for another a travel agent 3. U.S. government employee: an investigator or representative employed by a government or other organization a federal agent 4. causative substance: something such as a chemical substance, organism, or natural force that causes an effect a cleansing agent 5. means effecting result: the means by which an effect or result is produced As C.E.O. you will be expected to be the main agent of change. 6. spy: a spy or agent provocateur (informal) 7. comput program for routine tasks: a computer program that works automatically on routine tasks such as sorting e-mail or gathering information [15th century. 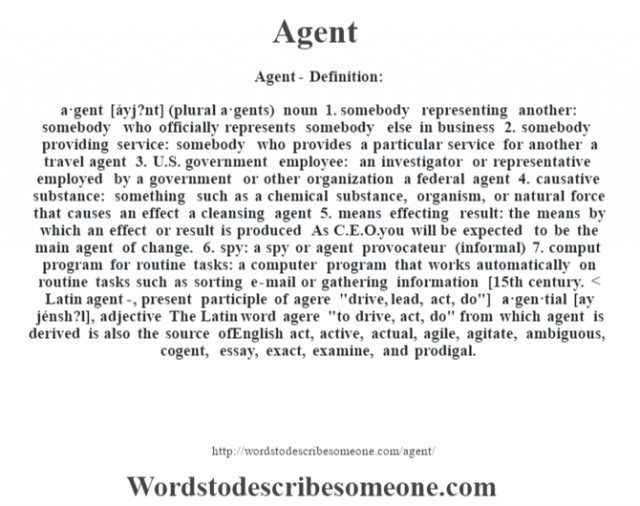 < Latin agent-, present participle of agere "drive, lead, act, do"] -a·gen·tial [ay jénsh?l], adjective The Latin word agere "to drive, act, do" from which agent is derived is also the source ofEnglish act, active, actual, agile, agitate, ambiguous, cogent, essay, exact, examine, and prodigal.